Turn pro now, Jameis Winston? With an hourly rate of $1,800, Ted Olson may be the most expensive lawyer in the country. But, as his pedigree and track record prove (e.g., Bush v. Gore, Proposition 8, etc. ), he is worth every penny. He demonstrated it again last evening with a masterful brief filed in opposition to the leagues' motion for a temporary restraining order and preliminary injunction. His persuasive and well-written brief (filed on behalf of Governor Christie) sets the stage for Judge Shipp to schedule oral argument tomorrow on whether a temporary restraining order should immediately issue against Monmouth Park Racetrack, which has announced plans to offer sports wagering to its patrons beginning this Sunday. Based on the strength of the response briefs (including those filed by the other New Jersey defendants), it also appears likely that Judge Shipp will also schedule a hearing for mid-November on the motion for preliminary injunction, which seeks an injunction of much longer duration than the temporary restraining order. In response to the leagues' argument that New Jersey's new legislation (a partial repeal of the sports betting ban, but limited to casinos and racetracks) is a "de facto authorization" of sports betting because casinos and racetracks remain subject to state licensing and regulation, Olson argues that New Jersey is doing precisely what the Third Circuit opinion allows. He writes that "[t]he 2014 Act's partial repeal of the State's prohibition on sports wagering tracks precisely what the Third Circuit held is permitted by PASPA. As the United States explained, under the Their Circuit's decision, PASPA permits States to repeal their prohibitions on sports wagering 'in whole or in part.' That is exactly what New Jersey has done." Olson adds that the Third Circuit opinion further specified that the New Jersey defendants "were permitted to specify what the exact contours of the prohibition [on sports wagering] will be." Olson also highlights prior statements made by United States Attorney Paul Fishman and league counsel Jeffrey Mishkin (at the Third Circuit oral argument) agreeing that a repeal would be permissible under ASPA. "In response to New Jersey's argument that PASPA violated the United States Constitution because it commandeered New Jersey's authority by effectively requiring it to maintain unwanted state-law prohibitions on sports wagering," Olson explained that "to save PASPA from that constitutional attack," the leagues and the DOJ "repeatedly conceded that PASPA does not require New Jersey to maintain its prohibitions on sports wagering." He notes that at oral argument before the Third Circuit, Mr. Fishman acknowledged that New Jersey "could" as a matter of law repeal its ban on sports wagering. Likewise, as Olson pointed out, league attorney Mishkin conceded that "nothing in PASPA requires states to enact, maintain, or enforce any prohibitions on sports gambling." Olson then adds this zinger (perhaps channeling judicial estoppel): "Having repeatedly urged this Court, and the Third Circuit, to adopt the view that PASPA does not prevent a State from repealing prohibitions against sports wagering, Plaintiffs cannot now be heard to complain when the New Jersey Legislature did exactly that." No "Equivalence" Between "Authorization" and "Repeal"
Addressing the leagues' argument that the partial repeal of the state-law ban on sports betting is a "de facto authorization," Olson points to language in the Third Circuit opinion holding that "there is no 'equivalence' between 'repeal and authorization' and that a repeal of prohibitions on sports wagering would not 'authorize by law' that activity." He adds that "Plaintiffs cannot have it both ways; either PASPA permits States to repeal their prohibitions against sports wagering in whole or in part, as does the 2014 Act, or PASPA unconstitutionally commandeers states authority by forcing States to maintain unwanted prohibitions." In response to the leagues' argument that the partial repeal is a "half-measure" (see, even Paul Clement quotes Breaking Bad) directed only at "state-authorized gambling venues," Olson writes that the league position is "flatly contradicted" by the Third Circuit's ruling, which explained that "States remain free to define the 'contours of the[ir] prohibition -- a holding that Plaintiffs tellingly fail to acknowledge." Olson maintains that "Plaintiffs' contrary contention that PASPA permits States only the choice of an absolute prohibition on all sports wagering or no prohibitions whatsoever on sports wagering is irreconcilable with the Third Circuit's ruling, the stated position of the United States, and common sense." Olson also takes aim at the leagues' argument that the partial repeal is a "de facto authorization"of sports betting because only state-licensed casinos and state-licensed racetracks are benefitted and they would remain subject to extensive state regulation, thereby enabling New Jersey to "regulate"sports betting, even if indirectly. Olson makes two great points to counter that. First, he observes that this would still be true even under a "complete repeal" of the ban against sports wagering. Olson writes that "[i]f background regulation of other activities at casinos and racetracks constitutes an authorization of sports wagering, then even if a state were to take Plaintiffs' suggestion and repeal all laws against sports wagering, that background regulation, licensure and taxation of businesses still would violate PASPA (under Plaintiffs' interpretation). The choice between prohibiting sports betting and foregoing all regulation and taxation of businesses is not merely a 'hard' choice but is indeed 'no choice at all,' and therefore unconstitutional." Olson also challenges the leagues' assertion that only "state-licensed" venues are involved, pointing to language in the new law that also repeals prohibitions at 'former racetracks' which have been converted to other uses and are not regulated by the State Defendants at all." Those in the know speculate that one of the "former racetracks" that would house unregulated sports betting is Garden State Park, in Cherry Hill, NJ, right outside of Philadelphia). Georgia: Guilty until proven innocent? Please explain. The University of Georgia is now requesting that the NCAA tell the university that its initial determination that Todd Gurley is ineligible for accepting money for signing autographs was clearly wrong. Here is how this rather curious process works as set forth in NCAA bylaws 14.10, 14.11, and 14.12. First, it is the obligation of the university to immediately withhold an athlete from competition if the university determines that the athlete "is ineligible under the [NCAA’s] constitution, bylaws, or other regulations." Then, after the university makes such a determination, if the university "concludes that the circumstances warrant restoration," it may then appeal to the "Committee on Student-Athlete Reinstatement" for restoration of the athlete’s eligibility. The Reinstatement Committee can then restore the athlete's eligibility only if, after reviewing the eligibility dispute, it decides that the "circumstances clearly warrant restoration." Georgia decided that Gurley is ineligible under NCAA rules and is appealing its decision because (for some unreported reason) it now believes Gurley should NOT be ineligible; and Georgia must convince a reviewing committee made up of members selected by the NCAA that its determination of ineligibility was clearly wrong. Why isn't the media demanding to know from Georgia the reason it now believes Gurley should not be ineligible? Make Georgia tell us what has suddenly changed. Did Georgia make the mistake of declaring Gurley ineligible without sufficient evidence that Gurley accepted money? Is there new evidence that has surfaced suggesting that Gurley did not accept money? Or is it simply because Gurley has "admitted his mistake"? On Tuesday, the four major professional sports leagues and the NCAA opened up a second front in their latest legal campaign against sports betting in New Jersey. The leagues had filed suit on Monday in response to the enactment of Senate Bill 2460, the new law signed by Governor Christie partially repealing the state-law ban against sports betting (but only for casinos and racetracks). On Tuesday, the leagues filed a motion for a temporary restraining order and preliminary injunction to prevent Monmouth Park Racetrack from proceeding with its previously-announced plans to offer sports wagering beginning this Sunday (in reliance on that new law). In short, the leagues are seeking two basic forms of relief: (1) a temporary restraining order to maintain the status quo (e.g., no sports betting anywhere in New Jersey) pending a determination on the merits of the leagues' motion for a preliminary injunction; and (2) following a hearing, the entry of a preliminary injunction enjoining all of the New Jersey defendants (e.g., Governor Christie, the NJ Division of Gaming Enforcement, the NJ Racing Commission, the NJ Thoroughbred Horsemen's Authority, and the NJ Sports and Exposition Authority) from "sponsoring, operating, advertising, promoting, licensing, authorizing, or otherwise permitting" sports wagering in any Atlantic City casino or any New Jersey racetrack during the pendency of the action (in other words, until the case is over). Why ask for both a "temporary restraining order" and a "preliminary injunction"? Aren't they basically the same thing? While they are similar remedies, they serve different purposes. A temporary restraining order preserves the status quo until a preliminary injunction hearing can be held, while a preliminary injunction preserves the status quo pending a full trial on the merits. The main difference is their timing and duration. A temporary restraining order is typically issued first and remains in effect through the preliminary injunction hearing, and then would be replaced by a preliminary injunction for the balance of the case (unless, of course, the motion for preliminary injunction is denied). If the motion for a preliminary injunction is denied, then the temporary restraining order is dissolved. What must the leagues prove in order to obtain either a temporary restraining order or preliminary injunction? With one not-too-minor exception (discussed in the next point), the requirements are the same for each. The leagues must show that: (a) they have a "reasonable probability of success" on the merits; (b) they will suffer "irreparable harm" if sports betting were to occur in New Jersey; (c) that the harm to the leagues "outweighs" any harm that would be suffered by the New Jersey defendants if an injunction were entered; and (d) that the "public interest" favors such relief. A party seeking a temporary restraining order must also show an "immediate" irreparable injury. Here, the leagues point to the fact that Monmouth Park Racetrack has stated its intention to start offering sports betting on Sunday, October 26th, only four days from now. That seems pretty immediate to me. What does a "reasonable probability of success on the merits" mean? For one thing, it does not mean that the leagues have to prove their entire case with certainty. Nor does it require the leagues to demonstrate a mathematical probability of success on the merits, such as greater than 50 percent. Rather, the leagues need only show a "fair chance" of prevailing after discovery and a full trial. This is a relatively low bar. Of course, the New Jersey defendants will counter that by arguing that a preliminarily injunction is an extraordinary remedy that should sparingly be granted. So, what are the leagues' arguments "on the merits"? They make three separate arguments, any one of which (if proven) would support an injunction. First, the leagues argue that the new law violates PASPA. Although styled as a "repeal," the leagues assert that this is "just word play." They point to the fact that the repeal is conveniently limited to state-licensed casinos and state-licensed racetracks, which remain subject to extensive regulation by the State. The leagues argue that "[b]y repealing existing prohibitions only at these 'closely' 'State-regulated' venues, New Jersey has accomplished exactly what this Court already has concluded that federal law prohibits it from doing: authorizing sports gambling that is licensed and regulated by the State." In a prior post, I explained the myriad ways that the States could regulate sports books indirectly. As a second "merits" argument, the leagues invoke the New Jersey Constitution. They argue that even if the new law "is really nothing more than the 'repeal' that it purports to be," then it violates Article IV, Section 7 of the New Jersey Constitution, which states that no gambling may be conducted in the State "unless it has been authorized by law by the Legislature." Thus, the leagues maintain, "under the clear provisions of the New Jersey Constitution, the Legislature and the governor are powerless to permit any form of gambling in Atlantic City casinos unless it is specifically 'authorized by law.'" Under this line of reasoning, a "repeal" of a ban on sports wagering cannot logically be an "authorization" of sports betting. Thus, the leagues are trying to box New Jersey into a corner: if the new law is a de facto authorization of sports betting, it violates PASPA's prohibition against state-authorized sports betting. But, if it is a "repeal" (rather than an authorization), then it violates the New Jersey Constitution. Look for New Jersey to counter this by arguing that the leagues, none of which are citizens of New Jersey, lack standing to asset the New Jersey Constitution as basis for challenging the validity of the new law. (Thanks to Tony Batt of Gambling Compliance for tipping me off to that argument. He's been around this case long enough to have earned an honorary degree in constitutional law). On the issue of "irreparable harm," the leagues point to Judge Shipp's February 28, 2013 Order which granted a permanent injunction to the leagues based upon a specific finding of "irreparable harm." In that order, Judge Shipp wrote that the spread of sports gambling "would engender the very ills that PASPA sought to combat." The leagues also cite an earlier order by Judge Shipp concluding that the injury suffered by the leagues is "the negative effect" that state-sanctioned sports betting on their own games "would have upon the perception of [their] games and their relationship with their fans." The leagues also note that the Third Circuit agreed with Judge Shipp on this point, finding that there is a "proven stigmatizing effect of having sporting contests associated with gambling, a link that is confirmed by commonsense and Congress' own conclusions in PASPA." The leagues clearly believe that this essential element of injunctive relief is already in the "win" column based on the prior judicial rulings. But a lot has changed over the past 18 months. At the recent Bloomberg Sports Business Summit, NBA Commissioner Adam Silver proclaimed that expanded legal sports betting was ‘inevitable” and that the league would “ultimately participate in that.” Around the same time, the NBA lifted its ban against teams selling sponsorships to daily fantasy sports operators, reasoning that such a move would open up new streams of revenue and “increase connectivity to fans." With Commissioner Silver's comments (suggesting that the leagues' acquiescence on sports betting is available for "the right price") and the NBA's recent embrace of daily fantasy sports leagues – which some have characterized as akin to sports betting – can the leagues genuinely say that they would be "irreparably harmed" if legal sports wagering were to take place in New Jersey? It seems like a suspect argument in light of recent events. Expect the New Jersey defendants to seize upon this hypocrisy in tonight's expected response. There is an expedited briefing schedule. Judge Shipp has ordered the New Jersey defendants to file a response to the leagues' motion by October 22nd (which is today! ), and the leagues must file their reply brief one day later. The motion will thus be fully briefed by Thursday. Judge Shipp has not yet decided whether he will hear oral argument on the leagues' motion. A docket notation entered on PACER yesterday states that "[f]ollowing review of the papers, the Court will advise as to whether it will hear oral argument on the application. If the Court elects to hear oral argument on the application, it will issue a text order that sets forth the date and time of the oral argument." I believe that the decision on whether to hold oral argument will be made by Judge Shipp on Thursday (after reviewing New Jersey's response to the motion). Based on his past rulings in this case, I fully expect Judge Shipp to conduct a hearing on the leagues' motion. Virtually every important motion in this case, including the recently-withdrawn motion for clarification and/or modification of the existing injunction (which was not particularly strong), was scheduled for oral argument. This one should be no exception. But the Court is not required to hold oral argument. Hearings are required on motions for preliminary injunctions only when there are disputed factual issues. If the material facts are not in dispute, then a hearing is not required. While the issues involving PASPA and the New Jersey Constitution do not appear to be intensely factual, the same cannot be said about the issue regarding the ownership status of Monmouth Park. It appears as if that argument will present a factual dispute for a hearing. Look for Judge Shipp to eventually schedule two types of hearings. He will likely schedule oral argument for this Friday on the issue of whether a temporary restraining order should be entered. That order will probably come down on Thursday. Judge Shipp will likely also schedule a second hearing -- probably for mid-November -- on whether a preliminary injunction for the duration of the case should be entered. Now the big question? Will there be sports betting at Monmouth Park on Sunday? In a word, no. Judge Shipp will likely issue a temporary restraining order against the New Jersey defendants on Friday (following oral argument) for the purpose of preserving the status quo until the motion for preliminary injunction can be heard in mid-November (or perhaps later). This means there will likely be no sports betting at Monmouth Park Racetrack on Sunday, or at any time thereafter until the court decides the preliminary injunction motion. What would be the amount of an appropriate bond here? Whatever it is, the leagues will surely be able to afford it. But I'm not sure that the State or any of its political leaders would be able to show "losses" resulting from a wrongly-issued injunction. After all, the State would not be deprived of taxes on sports betting revenues, as such activity would presumably be unregulated and untaxed under the new repeal law. Would New Jersey be so bold as to argue that it would suffer a diminution in tax payments on other gaming revenues (e.g., casino games and horse races) if sports betting were enjoined by virtue of the fact that sports books in casinos and racetracks are expected to bolster attendance and increase wagering on casino games, poker, and horse racing. Seems like a dangerous argument to make, as well as speculative (given the lack of a prior track record). Monmouth Park would be in a much better position to argue for a bond, since it is presumably a "private enterprise" (although the leagues would dispute that). The losses that Monmouth Park would suffer from a wrongly-issued injunction would consist primarily of its lost gaming revenues (from both sports betting and horse racing) multiplied by the number of days that the preliminary injunction would remain in effect (e.g., more than one year). Since early forecasts were that legal sports betting in New Jersey would generate an estimated $1 billion in bets for the first year (and Monmouth Park would be one of only a handful of gaming operators allowed to operate sports books), Monmouth Park could realistically ask for an eight-figure bond. I love how the leagues refer to sports betting in their legal papers as "sports gambling" in an effort to make it sound more sinister and nefarious. Does anyone else find it a little too convenient that the New Jersey Attorney General held a press conference announcing the arrests of three persons on racketeering charges for operating a lucrative sports betting ring on the same day that the leagues filed their motion for temporary restraining order and preliminary injunction? According to a NJ.com article, Acting Attorney General John J. Hoffman said today that "the takedown of a lucrative sports betting operation by the notorious Genovese crime family serves as a prime example of why the state should allow residents to place such wagers legally." Message to Judge Shipp delivered! I am not very good at math. In an ESPN.com article, I was quoted as saying that Monmouth Park Racetrack has a "zero percent chance" of taking sports bets on Sunday. One of my Twitter followers (up to 413!) advised me to "stay away from options trading [since] nothing is ever 0% or 100% probability in a marketplace." As I predicted correctly (for the most part) over the weekend, the four major professional sports leagues and the NCAA responded on Monday to New Jersey's latest effort to bring legal sports betting to the Garden State. On Friday, New Jersey Governor Chris Christie signed legislation partially repealing the state-law prohibition against sports betting (but only for casinos and racetracks), thereby paving the way for deregulated (and legal) sports betting to commence on October 26th at Monmouth Park Racetrack. In a post on Saturday, I predicted that the leagues would fight back. And fight back they did. But, instead of moving for a preliminary injunction in the existing federal court action (which is what I predicted would occur), the leagues opted to file a brand new lawsuit in the same court. I suspect that the leagues went this route because the New Jersey Sports and Exposition Authority (the alleged owner of Monmouth Park Racetrack, where sports betting is slated to start this Sunday) was not a party to the prior lawsuit. Thus, a new lawsuit was needed to properly exercise jurisdiction over Monmouth Park Racetrack. Accusing New Jersey of acting "in defiance of this Court's February 28, 2013 Order [permanently enjoining New Jersey officials from authorizing, licensing or regulating sports betting] and in clear violation of federal law," the leagues immediately take aim at the "label" used by New Jersey in describing the new law. The leagues assert that while the new law is "styled as a repeal," in reality, it "is nothing more than a de facto authorization of sports gambling," pointing to the fact that the repeal is limited to state-licensed casinos and state-licensed racetracks, which remain subject to extensive regulation by the State. Therefore, despite its facial "repeal" language, the leagues argue that the new law "is a blatant attempt to by the State to sponsor, operate, advertise, promote, license, and/or authorize sports gambling in Atlantic City casinos and New Jersey racetracks," in violation of PASPA. Alternatively, the leagues argue that even if the new law "is really nothing more than the 'repeal' that it purports to be," then it violates the New Jersey Constitution, which requires any gambling to be "specifically authorized" by the New Jersey Legislature. By definition, a "repeal" of a ban on sports wagering is not an "authorization" of same. Even though the Complaint asks for an injunction, the leagues would still need to file a motion for a preliminary injunction in order to prevent Monmouth Park Racetrack from proceeding with its plans to offer sports betting on Sunday. A complaint, by itself, would not accomplish that in the short term. In federal court, defendants are given 21 days to answer a complaint. By the time Governor Christie and the other New Jersey defendants get around to responding to the complaint, sports betting will have already started at Monmouth Park and it may then be too late to put the genie back in the bottle. Therefore, the leagues would need to file a formal request for judicial intervention (which lawyers call a "motion") in order to put an immediate halt to those plans. Specifically, I expect the leagues to file an emergency motion for a temporary restraining order and/or preliminary injunction within the next day or two. The leagues will ask Judge Shipp (to whom both cases are assigned) to enter a temporary restraining order immediately and on an ex parte basis in order to prevent Monmouth Park from commencing its sports betting operation on Sunday. The temporary restraining order would essentially maintain the status quo (e.g., no sports betting in New Jersey) until such time as the court can conduct a hearing on the motion for preliminary injunction (which would probably be in mid-to-late November). I expect Judge Shipp to sign such an order later this week, which would prevent Monmouth Park from offering any sports betting, effective immediately. The leagues would likely find Judge Shipp to be a very receptive audience since he previously ruled in their favor. Moreover, Judge Shipp made several rulings earlier in the case that are likely to influence any new ruling. For example, in his February 28, 2013 order granting summary judgment in favor of the leagues and permanently enjoining New Jersey from implementing its sports betting law, Judge Shipp held that the leagues would suffer "irreparable harm" in the form of a "reputational injury" through the unwanted association with gambling and from fans' negative perceptions that the outcomes of games may be rigged. In that same ruling, he also held that there was an "inadequate remedy at law" because New Jersey, by operation of the Eleventh Amendment, would not be liable for monetary damages. Judge Shipp also held that the entry of a permanent injunction against New Jersey would serve the "public interest." Each of these prior findings would bear directly on any new motion for preliminary injunction filed by the leagues since the same considerations are at play. Since Judge Shipp has already ruled in the leagues' favor on these issues, I would expect him to do so again. Thus, the leagues' entitlement to a preliminary injunction will likely come down to whether they can establish a "probability of success on the merits," since each of the other elements required for an injunction (e.g., irreparable harm, balancing of the harms, and the public interest) will almost assuredly be decided in the leagues' favor based on Judge Shipp's prior rulings. Last year at a conference I met Sean Stellato, an NFL agent based in Massachusetts. Sean has over a dozen clients on the Patriots and other NFL teams. Sean has since become an insightful and candid mentor to my UNH Law students who are interested in becoming agents. Sean is the author of a new book, No Backing Down, that raises sports law issues in a high school sports context. 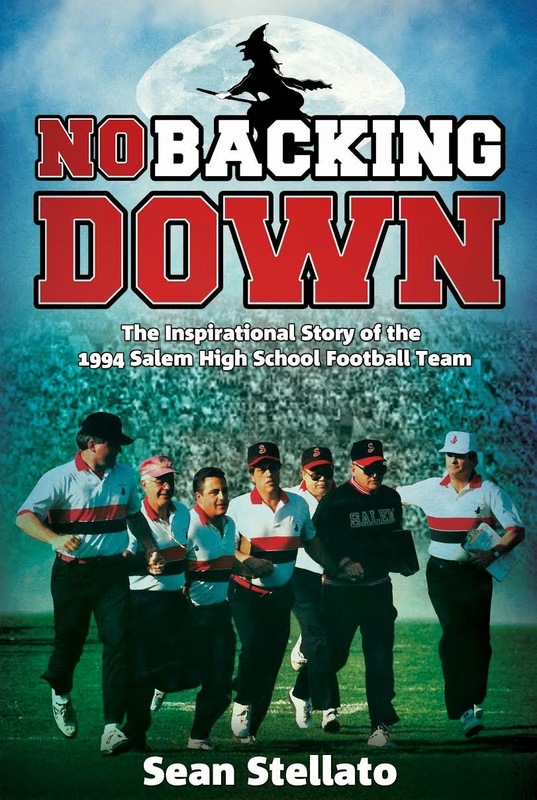 The book is about how a teachers' strike in Salem, Massachusetts back in 1994 resulted in Salem High School's head football coach Ken Perrone defying an order to cease and desist to coach his team to the state's Super Bowl. Perrone's decision attracted national attention and it quickly became a headline sports story in Massachusetts. I had recently been a student at nearby St. John's Prep in Danvers, Massachusetts when this controversy took place and remember it well. Perrone and his coaching staff paid a steep price. They were sharply criticized by the town's school board and lost their jobs. With yesterday's bombshell announcement that New Jersey Governor Chris Christie signed legislation partially repealing the state-law prohibition against sports wagering and also withdrew his federal court motion seeking to clarify the existing injunction, many are trumpeting the arrival of legal sports betting in New Jersey. But not so fast. While Monmouth Park Racetrack is making plans to launch sports wagering beginning on October 26th, Atlantic City's casinos are wisely taking a "wait-and-see" approach. And for good reason too, as legal sports betting in New Jersey remains a long shot despite Governor Christie's headline-grabbing move yesterday. I expect the sports leagues and the DOJ to counter New Jersey's surprise move by dropping a bombshell of their own next week: they will likely file an emergency motion for an ex parte temporary restraining order prohibiting Monmouth Park and any other licensed racetrack or casino from offering sports betting. As part of that request, the leagues and the DOJ will also ask the federal court judge (Michael A. Shipp) to schedule a hearing on a motion for preliminary injunction. Expect the leagues and the DOJ to argue that New Jersey's partial repeal (which is limited solely to casinos and racetracks) runs afoul of the Professional and Amateur Sports Protection Act ("PASPA"), which prohibits States from "sponsoring, licensing or authorizing" sports wagering, because casinos and racetracks require licenses to operate in New Jersey and are heavily regulated by the State. Thus, as the DOJ argued in their response to New Jersey's motion last month, "[a]s long as the only entities that may engage in sports wagering must be licensed by New Jersey, New Jersey is in effect licensing sports wagering, which is squarely within PASPA's licensing prohibition." [V]irtually every detail concerning the operation of casinos and racetracks is heavily regulated by both State law and by regulations promulgated by the [Division of Gaming Enforcement] and Racing Commission. For example, State regulations upon casinos and racetracks include licensing and permitting requirements (e.g., N.J. Stat. Ann. ss 5:5-32 & 5:12-96), specifications on equipment used for gambling (id., ss 5:5-63; 5:12-100), and payment to the State of a portion of revenue derived from casino and racetrack wagering (id., ss 5:5-48; 5:12-144). According to defendants, all of these regulations will apply equally to sports wagering [under a partial repeal]. In other words, in their view, this Court's injunction leaves New Jersey free to accomplish precisely what the Sports Wagering Law was enacted to achieve: state-regulated sports wagering in casinos and racetracks. Not only is that result flatly inconsistent with this Court's injunction; it is flatly inconsistent with PASPA. PASPA does not prohibit States from repealing existing prohibitions ad "complete[ly] deregulating" sports wagering. [citation omitted]. But it does prohibit States from simply labeling something a "repeal" that is plainly, in substance, authorization and regulation of sports gambling. Accordingly, defendants' latest arguments are nothing more than a blatant attempt to circumvent the Court's injunction and the federal law that it prohibits defendants from violating. The leagues and the DOJ make a fair point about New Jersey's partial repeal being a "back-door" licensing and regulation of sports betting. Think about it. What do you think would happen if the sports book of a New Jersey casino or racetrack accepted "prohibited wagers," such as wagers from persons under the age of 21 or wagers on contests involving New Jersey collegiate sports teams, both of which are prohibited under the new law. They would be prosecuted, of course, by New Jersey law enforcement authorities. But don't think for one second that New Jersey gaming regulators (such as the Division of Gaming Enforcement) wouldn't also take a hard look at such illegal activity. A casino and racetrack that accepted illegal sports bets could very well find its license suspended, revoked or non-renewed, and also be subjected to substantial fines. Consider what might also occur if a New Jersey casino or racetrack accepted sports wagers from convicted felons or failed to honor winning wagers. Their State-issued license would be in serious jeopardy. Thus, a persuasive argument can be made that, even under a partial repeal, New Jersey would still be able to "regulate" the sports wagering activities of casinos and racetracks. And what about the revenues attributable to sports wagering? Under existing law, New Jersey's casinos are required to pay the state 8% of gross gaming revenues (GGR)? Would revenues from sports wagers be included in GGR? If they are included, the state would be "taxing" the sports wagering activities of its licensed casinos, which could be viewed as a violation of PASPA. But even if New Jersey did not directly tax sports wagering revenues, it would still "indirectly" tax sports betting by virtue of the fact that the presence of sports books at casinos and racetracks would attract additional patrons who would wager on casino games or horse races, thereby increasing both GGR and the tax payments thereon. Either way, the State would reap a substantial monetary benefit from "unregulated" sports wagering, which might very well place its recent legislative action in the cross-hairs of PASPA. And has anyone considered the Wire Act as a possible surprise argument by the leagues and the DOJ? The Wire Act prohibits the use of a "wire communication facility for the transmission in interstate or foreign commerce of bets or wagers on any sporting event or contest." 18 U.S.C. s 1084(a). Sports books, such as those operating in Nevada (and possibly Monmouth Park), use computerized bookmaking services and communications technology to handle their sports bets. Could the use of such technology by Monmouth Park or another New Jersey gaming operator trigger the Wire Act? Possibly. Remember, the Third Circuit has already concluded that sports wagering "substantially affects interstate commerce." It will be interesting to see if the leagues invoke the Wire Act next week as part of their expected assault on Monmouth Park's plans to offer sports betting beginning October 26th. Several people have asked me whether Monmouth Park, a private entity (although the leagues would dispute that), is beyond the reach of PASPA. Since PASPA prohibits state-sponsored sports betting, their reasoning is that private persons are not covered by PASPA. But that overlooks Section 3702(2) of PASPA, which prohibits private parties from conducting sports wagering "pursuant to the law or compact of a governmental entity." The leagues would argue that Monmouth Park's operation of a sports books is "pursuant to the law" signed by Governor Christie on Friday. The leagues are also expected to argue that Monmouth Park is a "state governmental entity' (and thus subject to PASPA) because it is owned and operated by the New Jersey Sports and Exposition Authority ("NJSEA"). Thus, based on the state's alleged ownership of Monmouth Park, the Leagues would argue that any sports wagering conducted at Monmouth Park "would violate the provisions of PASPA that prohibit a State from directly sponsoring, operating, or advertising sports wagering." However, New Jersey officials are expected to dispute that characterization, claiming that the NJSEA only owns the land, but does not operate the racetrack. PREDICTION: At some point between October 20th and October 24th, the leagues and the DOJ will file an emergency motion for an ex parte temporary restraining order seeking to block Monmouth Park Racetrack from offering sports betting. The motion will be filed on an "emergency" basis because Monmouth Park has announced that it will offer sports betting beginning October 26th, which is one week away. The leagues and DOJ thus need to file their motion this week to have any realistic chance of blocking Monmouth Park from offering sports betting beginning next Sunday. Any delay in filing this motion could expose the leagues and the DOJ to the argument that they have "waived" the right to claim an "irreparable injury" (one of the requirements for a temporary restraining order and/or preliminary injunction). Thus, it would be a shocker if the leagues and the DOJ did not act quickly on this, such as by filing their motion on Monday or Tuesday. As part of their emergency motion, I expect the leagues and DOJ to also ask for a preliminary injunction prohibiting all New Jersey casinos and racetracks from conducting sports wagering. Judge Shipp will likely issue the temporary restraining order later this week, and schedule a hearing on the preliminary injunction for November (possibly the same November 21st date that was already slotted for the hearing on New Jersey's now-withdrawn motion for clarification and/or modification of the injunction). Things are about to get real interesting in New Jersey! In a new SI.com article, I look at the many reasons why Jameis Winston should be worried about a university hearing and what legal options he has to stop it. I interviewed several top legal minds for this story, including Daniel Wallach, Erin Buzuvis, Todd Zywicki, Alan Milstein and John Banzhaf. Hope you can read it. In a new column for Sports Illustrated, I argue that Jameis Winston should be seriously considering dropping out of Florida State University and turning his attention to the 2015 NFL draft. My argument is based on the forthcoming FSU disciplinary hearing, which Winston and his attorneys may regard as designed to reflect poorly on Winston. I interview Alan Milstein (who litigated on behalf of Maurice Clarett while he was at Ohio State) and Dan Wallach. Hope you have a chance to read it. 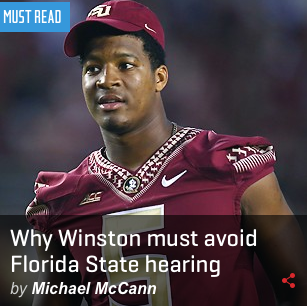 Winston has yet another important reason to drop out: He may later have an adversarial relationship with Florida State as a co-defendant. It is widely expected that Winston’s accuser will eventually sue Winston, Florida State and the Tallahassee Police Department. This litigation could place the three as co-defendants in the same lawsuit or as defendants in separate lawsuits. In either scenario, each would attempt to deflect fault away from itself and onto the other two. Should Winston testify in a disciplinary hearing, Florida State could later use those statements to pin the blame on Winston. To read the rest, click here. For a video on 120 Sports on this SI column, check out this video. 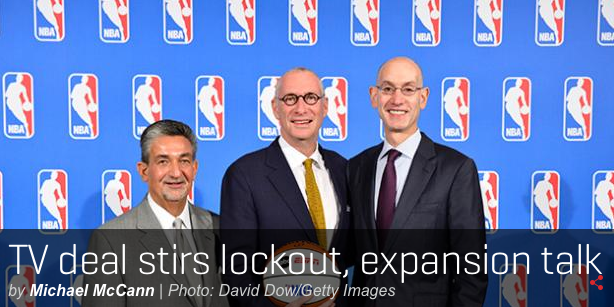 What does the NBA's new TV deal mean for a lockout and expansion? I have a new column for Sports Illustrated on the legal and business impact of the NBA's new $24 billion deal with ESPN and Turner. Hope you have a chance to check it out. After he took over as commissioner earlier this year, Silver surprised many by expressing that raising the NBA’s age eligibility rule was his top priority. The rule, which is contained in the CBA, requires that U.S. players be at least 19 years old and one year out of high school, while international players -- many of whom turn pro in foreign leagues when they are 14 or 15 -- be at least 19 years old. The rule is controversial on many fronts, and as a disclosure, I have long argued against a rule that prevents players from entering the NBA out of high school. The view of Silver and many others is that the NBA would be better off with older, more polished players. These players are also more marketable when they enter the NBA as their names are often familiar to NBA fans who follow college basketball. Any change to the league’s eligibility rule would have to be collectively bargained with the NBPA. The NBPA represents the interests of prospective players even though those players, who are in high school or younger, are not NBPA members and thus have no seat at the bargaining table. One twist to the age eligibility discussion is the possibility that NBA’s D-League could become a more attractive employer to players who are legally too young for the NBA but not interested in playing college basketball or going abroad. The D-League’s age limit is 18, meaning that players are eligible for employment out of high school. Few take advantage of that option due to the league’s low salaries for a six-month season. D-League salaries are reportedly capped at $25,000, although players on NBA contracts who are assigned to the D-League are still paid their NBA salaries. In his press conference Monday, Silver highlighted that the D-League would benefit from the new TV deal. To that extent, increased TV revenue would mean higher salaries for players and a professional life more akin to playing in the NBA. That should enable the D-League to better compete with the NCAA for top young talent. How to break into sports law? Here's how I did it. 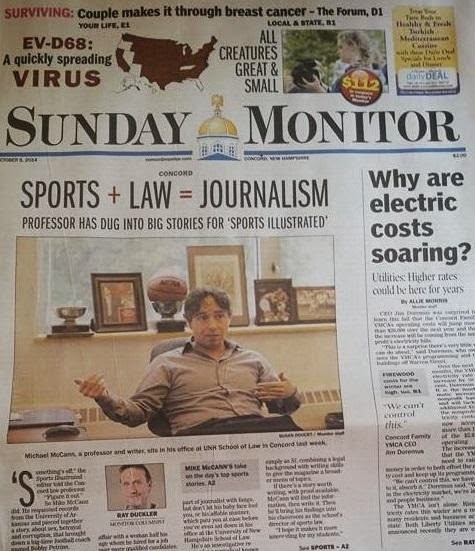 I'm honored to be the subject of an article in this past Sunday's Concord Monitor. News columnist Ray Duckler penned the story, in which I talk about how I broke into sports law, some of the stories I've covered and sports figures I've interviewed and how I use my Sports Illustrated work to better teach my UNH Law sports and entertainment law students. I hope you might enjoy reading it. McCann flew to Austin, Texas. He rented a car and drove to Armstrong’s estate, a huge compound enclosed by an electronic gate. Once McCann figured out how to use the digital communications device, the housekeeper let him in and Armstrong moved down a spiral staircase for their talk. “His central theme was that everyone was cheating, so why was his conduct elevated to this position?” McCann said. The two discussed a $100 million lawsuit filed by the U.S. Postal Service, which sponsored Armstrong’s team with a $40 million investment. The suit, still pending, claims the USPS would not have paid the money had it known Armstrong and his teammates were cheating to win races. Earlier today, Judge Shipp entered an order setting oral argument for October 31, 2014, at 1:00 PM in Trenton. (The docket notation is below). This comes as a surprise (and could be seen as a positive development for New Jersey) because Judge Shipp had previously said that the motion "will be decided on the papers." The NFL and the NFLPA announced yesterday that they have agreed to hire a neutral arbitrator to hear Ray Rice's appeal. The arbitrator they selected is former U.S. District judge Barbara S. Jones, who served in the Southern District of New York from 1996-2013. The appointment of a mutually agreed upon neutral arbitrator to hear an appeal of commissioner discipline for off-field misconduct in the NFL is a significant development and long overdue. It will be interesting to see whether this has a precedent-setting effect going forward for all appeals of commissioner discipline for off-field misconduct. In his new book, Baseball as a Road to God, New York University President and Professor of Law John Sexton submits that baseball can serve as a vehicle for living a more conscious life that elevates the human experience for lawyers and non-lawyers. This Essay examines the credibility of the book’s thesis in a world where human intelligence, human deliberation, and human action is being replaced by artificial intelligence, mathematical models, and mechanical automation. It uses the preeminent national pastime of baseball, and the less eminent pastimes of law and finance as case studies for the book’s thesis. It concludes that a more conscious and meaningful life is much harder to foster, but also much more important to cultivate in light of modern advances. This Essay ultimately offers a different narrative for lawyers and non-lawyers to think anew about modern law and society in light of ongoing changes in baseball, law, finance, and beyond. The NFL has been raked over the coals recently for its (mis)handling of incidents of domestic violence by players. In some ways, this seems unfair, in that we seem to be asking the NFL to do more and do better with domestic violence than anyone else. Domestic abuse is a society-wide problem and other institutions--judiciary, universities, law enforcement--have not shown much more skill in understanding or handling the problem. In any event, why should professional sports leaguesplay any role (much less a special one) on the subject--it is not clear that there is a higher rate of domestic violence among professional athletes (it may depend on what the comparison is) and one could argue that teams and leagues should not care about players' off-field conduct, just as most employers don't care about what their employees do outside of work. At another level, though, I wonder if it is fair to hold sports to a higher standard because of their history--a history that sports, leagues, and teams readily promote. Baseball regularly touts that it was ahead of society on integration--Jackie Robinson joined the Dodgers six years before Brown and two months before President Truman desegregated the military. The NBA has financially propped up the WNBA for almost twenty years, allowing for the longest-running professional teams-sports league. Creating athletic opportunities for women and girls is Title IX's most-visible achievement and what makes possible genuinely popular women's sporting events--University of Connecticut basketball, the US Women's National Soccer Team, etc.). NFL Commissioner Roger Goodell has made noise about the NFL being a moral leader--which is laughable (especially with Goodell as its head), but we should be able to take him at his word. So if sports and leagues have taken the lead in the past on some social issues and if they get much PR mileage out of that past, is it unreasonable to expect them to take the lead on this issue, when they clearly want to be involved? And if they fail so spectacularly, is it unreasonable to criticize them for that failure? Please note that this is a very incomplete thought, but I wanted to throw it out there for consideration and comment. Some commentators have highlighted the Celtics suspending Jared Sullinger in 2013 for an altercation with his girlfriend as a blueprint for addressing NBA players implicated in domestic violence. Yet Sullinger's situation is unlike the one facing Taylor. The Celtics only suspended Sullinger after criminal charges were dropped, meaning the suspension could not have prejudiced the criminal case against Sullinger or tainted a potential jury pool. It was also a one-game suspension that Sullinger, who acknowledged he could have used better judgment, accepted without opposition. What happens if the NBA or a team suspends a player while criminal charges are still pending? Would prosecutors subpoena the NBA or the player's team for its investigatory findings and then use the evidence against the player? Or what happens if a player adamantly denies the accusation? Is a league or team really in a position to know if the player is lying or telling the truth? Does it want to be in that position?